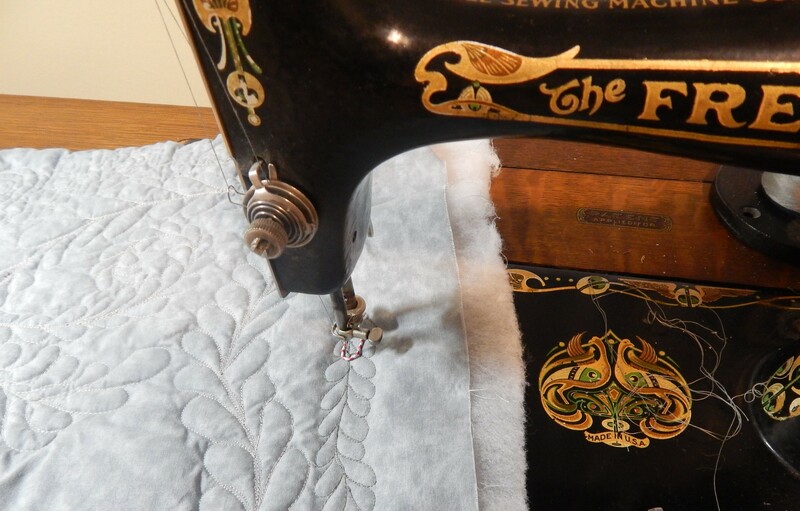 This entry was posted in Quilts and tagged antique sewing machine, Quilting, Quilts. Nice one! I have an old Elgin Rotary machine that needs a new motor and wiring and my husband is taking it apart to see what can be done with it. Not sure of the age, it has a #AAE 66543 on it and is in a cabinet, too. Such fun with these old machines! Beautiful old machine for sure. I’ve never seen one with those decals. Your paper clip ‘darning foot’ brought something to mind. I now must hunt for a wire spiral spring I have somewhere. The paper with it said was to connect to the machine for mending. Never tried to use it and could work with my Singer 99. 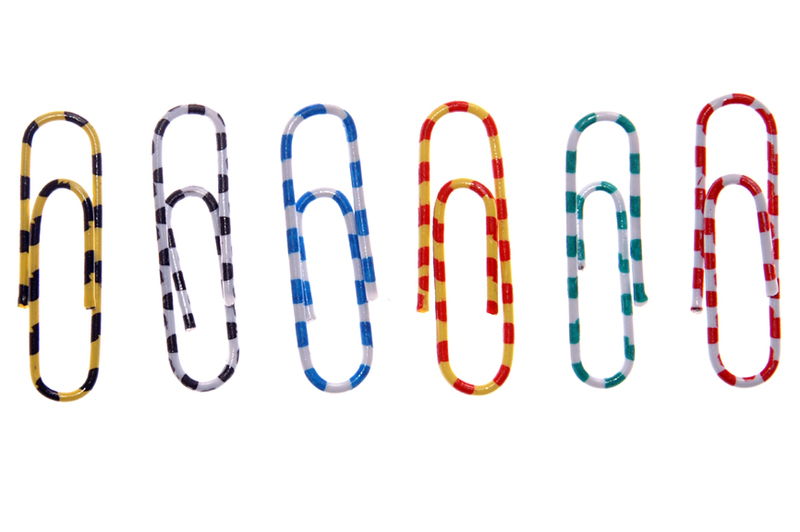 A paper clip – I am so impressed with your ingenuity! Love your new machine. Does s/he have a name? It looks brand new. Have fun seeing on it. And Teddy is as cute as ever. Beautiful machine, mine is not in near that good of condition. Hope you are abe to find a cabinet to put her in. Now you are AMAZING! I wouldn’t have thought of using a paper clip; but, yes, it is the perfect solution and so affordable as well! Your new machine is a beauty. I’m glad that she purrs when she runs. She is probably happy to be working again! 🙂 I think it is! Its a beautiful machine Tim. I bought a Pinnock just before Christmas, one owner, made in 1963. I love it. The lady who owned it had been using it up till a couple of weeks before I bought it. It is a real piece of engineering and weighs a LOT!. When asked why i was driving all that way to buy a 1963 sewing machine all I could say was “Because it is green”. They just wouldnt have understood. 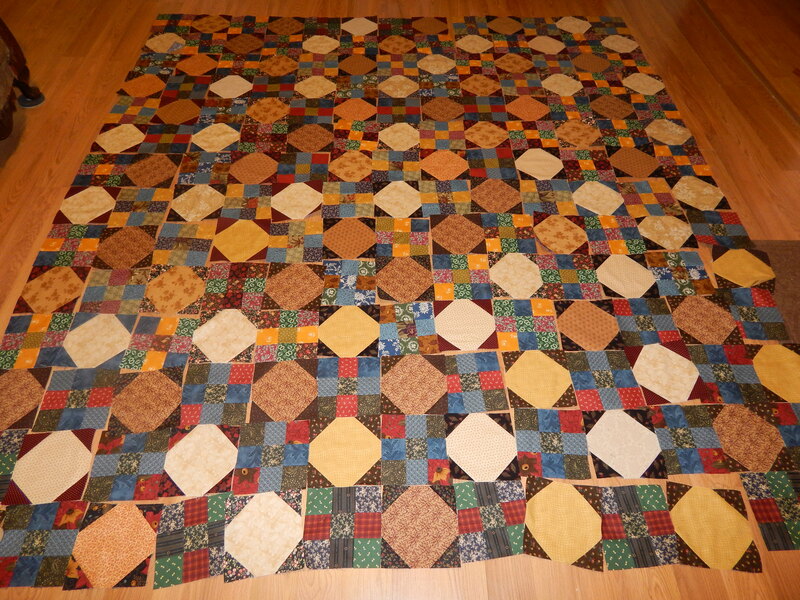 I like the ‘outside the box thinking’ re the quilting foot invention. Say hello to Teddy for me. I love that you can find out the age of your singer. I have a 66 that came off the line in 1944, making it 6 years younger than I am (I am 77). Our closeness in age must be why we get along so well! You really are a Renaissance man, handy with a needle, a paintbrush, a border spade and now with sewing machine motors and manufacturing your own darning foot. Do be sure to let us know how you go with that last one! 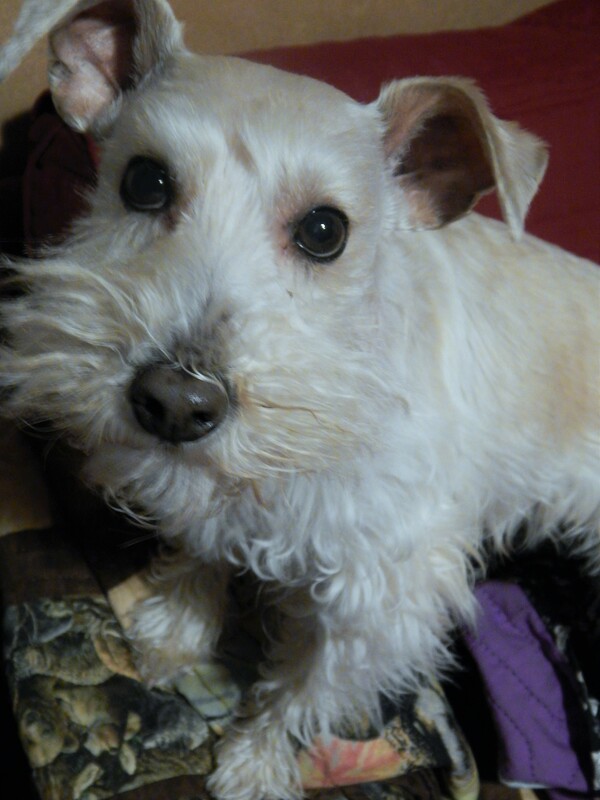 Teddy, in this picture it’s your nose that I love most. Which is saying a lot since all your parts are stunning. Do not get near Tim when he has a hand full of paperclips. Hi Tim, your new old Singer is gorgeous,I am sure you will enjoy using her! It is fun to use! 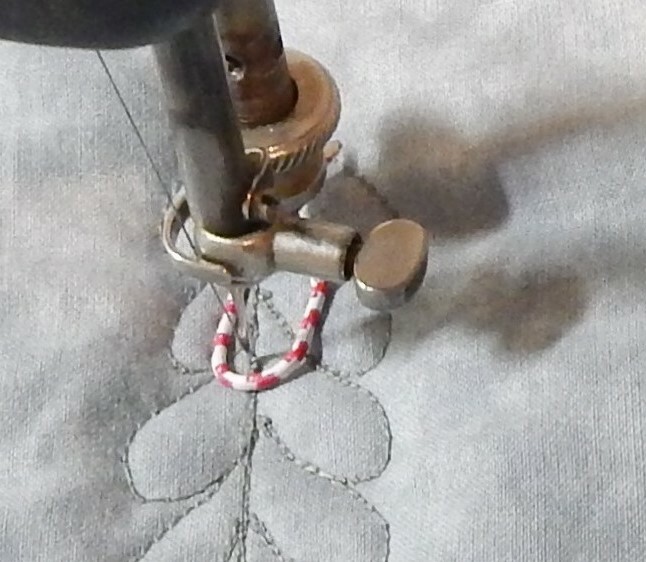 So clever to use a paper clip for a darning foot! Who would have thought. Hello back to Teddy. I watch a lot of period pieces on TV and found it odd that sewing machines were placed in living rooms. Maybe it was a status symbol to own one and maybe that is why your new one is so decorative. It really is a piece of art. I like the machine very much. 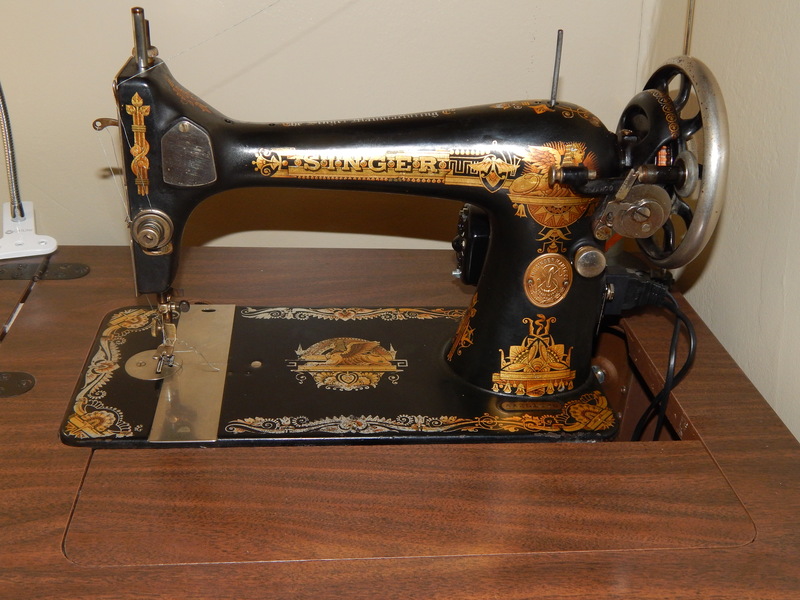 My mother had a motor put on the Singer treadle machine we had when I was a girl. It was a 1925 model. I’m telling you that was an awesome machine. Teddy looks so sweet, give him a scratch behind the ear for me. Thankyou for showing how to find the date of a sewing machine. I checked the hand machine that my mother made my baby-clothes on, and it is exactly the same age as I am, made here in England just before the 2nd world war. So poignant. Those decals look like they’re in great shape. How did you get that paper clip attached? That’s amazing. The snowball blocks look good. That’s paperclip trick is pretty neat. 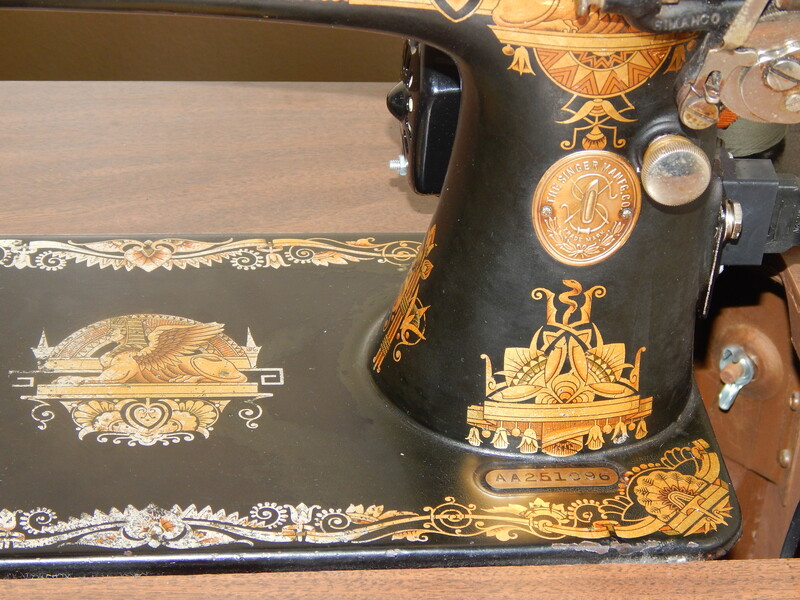 It’s hard to sew anything other than straight lines on these older machines. Nice work!